Part 1: Beyond Consequences paradigm. Children operate at an emotional level, where we can connect to them and understand that behavior is communication of a deeper level. We can create internal control and self-discipline. Works for all ages. Part 2: Spectrum of disorders: Reactive Attachment Disorder,Bipolar, Oppositional Defiant Disorder, Conduct Disorder, Aggression, Anxiety. 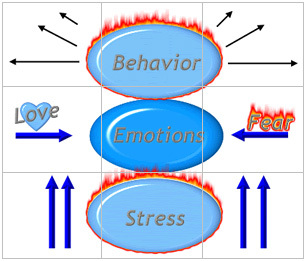 Behavioral problems indicate moving into a place of fear or stress,, out of a place of love. Problems with regulation. Root causes are often trauma at various levels. Behaviors are unconscious. Part 3: How can parents break through an attachment barrier? What does Love Never Fails mean? Part 4: Differences between responding and reacting. When parents yell and add more consequences, feeling out of control themselves. Parents dormant trauma and developmental history. Therapist works with the parent, not the child. Part 5: Finding the website and books (see links below). 1. All negative behaviors arise from an unconscious, fear-based state of stress. 2. There are only two primary emotions: Love and Fear. 3. There is both negative and positive repetitious conditioning. We are all conditioned in various ways, both good and bad. 4. Negative and positive neurophysiologic feedback loops exist beyond our conscious awareness. They occur at an unconscious, physiological level, and we have the ability to change or to add to these feedback loops. "Scared children do scary things." Love is being in the present moment. Pre-frontal cortex (Executive Functions): does not complete development until well into the 25th year of life!!!!!!!! 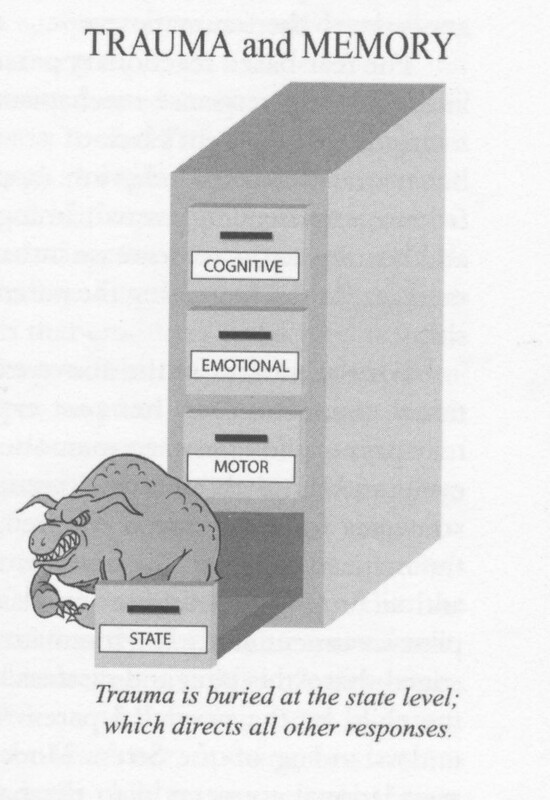 The first drawer is the cognitive drawer. This is where your brain holds data, including names of people, important dates. This is the drawer you are in when you are solving a math problem or trying to figure out your schedule for next week. You problem solve from here. Information in this drawer is normally at your disposal relatively quickly. The second drawer is your emotional drawer. This drawer contains all the emotions connected to your cognitive memories. For instance, you might run into an old friend and find yourself flooded with feelings, either positive or negative. But for your life, you cannot remember their last name. 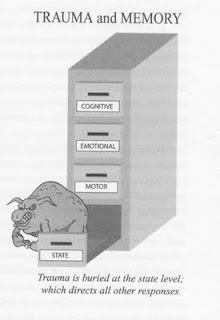 That is because the last name is in the cognitive drawer and right now, you are in the second drawer. You have accessed a stored emotion connected to that friend. The third drawer is the motor drawer. Here is where you are when you are literally writing the letters in the words on the page. Or when you are riding a bicycle or driving a car. These memories are subconscious. You do not have to concentrate on making the letter “b” when you write the word “baby”, because your body has remembered it and stored it away. You just write it, without any thought. It’s like what they say about riding a bike — once you learn how, you never forget. To a large extent, that is scientifically true. The fourth drawer is what we call the state drawer. The state drawer is the deepest level of memory inside your body. It is 100% subconscious. Our state drawer can contain many positive memories. Such as being held as a baby and nursed and all those pre-verbal needs being met. What’s in our state drawer dictates our personality. The positive memories in this drawer make us a trusting person. Or a funny person. Maybe open and emotionally available. Print a summary Parenting Alternatives to Control.